Ready to pounce on our checkbooks like ravenous pumas. AKA Mini Marketing and Sales Masterminds. Shopping malls, supermarkets, fitness centers—everywhere you look—Girl Scouts are locked and loaded with stacks of Thin Mints and Peanut Butter Patties as high as the Burj Khalifa. Add the power of the Internet and Digital Cookies to an already prolific foot coverage zone, do we even stand a chance? The answer is no. We can’t beat them. And that’s precisely why we should join them. Not as Girl Scouts literally, but as smart, organized, hyper-focused sales assassins. After all, it’s going to take some serious cash to support that bad case of the sweet tooth (and the later trips to the dentist). I’m not going to lie, I actually found myself getting “annoyed” this year by the local Girl Scouts pushing their scrumptious snack sales via public pitch. I know I sound like Grumpy Gramps, but I’ve been battling the woes of an intense diet since the New Year. 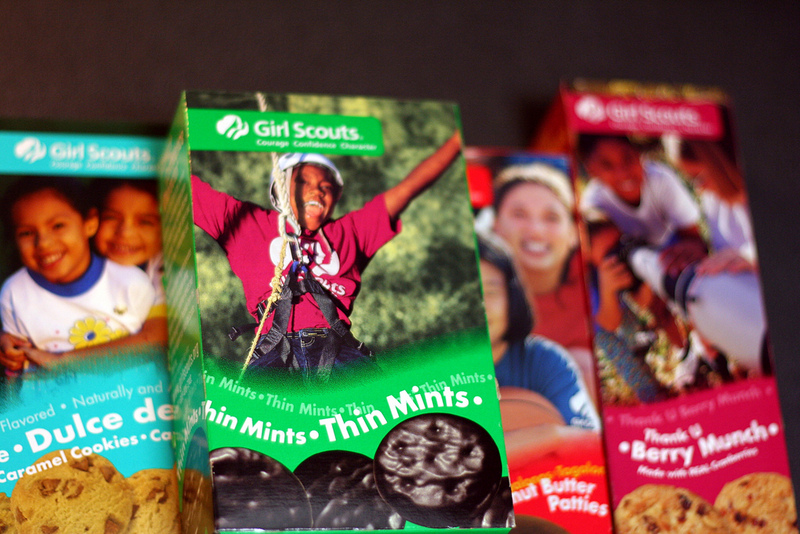 So give me a break, I’ve been dodging Girl Scout Cookies like Neo in The Matrix. But after giving it some more thought, putting personal vendettas aside, and tuning in to a more rational channel—I got to give The Girl Scouts props. They helped me realize some things that a lot of business owners and executives overlook. Girl Scouts of the USA have been selling cookie for two centuries. You don’t stick around that long without some pretty solid production or a perpetual goal. Over 1 million Girl Scouts participate in the cookie program each year. Hence why it seems like they’re everywhere you look. With this giant army, Girl Scouts bring in close to $800 million in total sales over the course of a cookie season. However, what’s perhaps the most interesting part about the Girl Scout model is that 100 percent of the net revenue from cookie sales stays within a Girl Scout council’s local area to benefit girls and their council. The cookie program is what fuels young girls to think big and take action in their communities. As put in their mission statement: Girl Scouting builds girls of courage, confidence, and character, who make the world a better place. This type of purpose is what truly builds and sustains sales. Provide purpose and meaning to your product and service and watch yourself convert more sales. The difference lies in making a difference. Have you ever heard someone say they just happened to be in the right place at the right time? Maybe they found twenty bucks on the side of the road. Or maybe they met the love of their life at a bar on a Friday night whim. Life is often a matter of circumstance and timing. Sales is no exception to this rule. You know that it’s unrealistic to obtain a sales conversion rate of 100%. You’re not going to find that twenty bucks on the side of the road, just because you went out for one fifteen-minute stroll in your neighborhood. But if you assign twenty different routes to your family and friends, and explore the many streets and sights in your town, then your chance of tripping over a green-faced Andrew Jackson increases exponentially. The Girl Scouts adopt this concept well. They know their power is in numbers and sheer persistence. They know that different approaches breed different results. Going out and tabling might not work well on Monday morning, but maybe having Dad take an order sheet to the office will. The point is that you never know when, where, and what will work. One of the best things you can do to increase your sales conversion rate is to simply find ways to be in multiple places at the same time. Whether it be through online advertising, marketing automation, or by scaling your team to promote your brand—the more places you can be, the more likely it’ll be the right time. We were all kids once. Yet, for many of us, the course of time has led to long work hours, keeping up with bills, and having to buy our own clothes, shelter and food. How tragic! When you’re simply going through the motions, it can sometimes become a bit of a challenge to maintain a consistent positive attitude and joyous appreciation for life. Even harder? Bringing this type of fire to the daily grind. But if you really want to increase your sales conversion rate, expressing positive energy in your demeanor and messaging is crucial. If passion and pride don’t wow your prospect—kill them with kindness. It’s been proven that showing off your pearly whites has many psychological advantages, both internally and externally. In fact, internal and external advantages work hand in hand. Essentially, if you smile, you start to feel good about yourself. If you feel good about yourself, then other people will start to feel good about you. And here’s the tie-in. When people feel good about you, they’re more likely to do business with you. So smile. Even at Grumpy Gramps. He might not be having a good day, but he’s got a sweet side too, and his diet could be different next year.